Family studies. In July 2015, we launched a German-Israeli-Palestinian collaborative project on familial epilepsy in Israel and Palestine. This project is supported by a specific funding mechanism by the German Research Foundation (DFG) called the Trilateral Grant. I thought that I would introduce the project to you, and let you know how we are planning to overcome our current crisis in family studies. Also, find out why I initially planned to write about Beethoven. 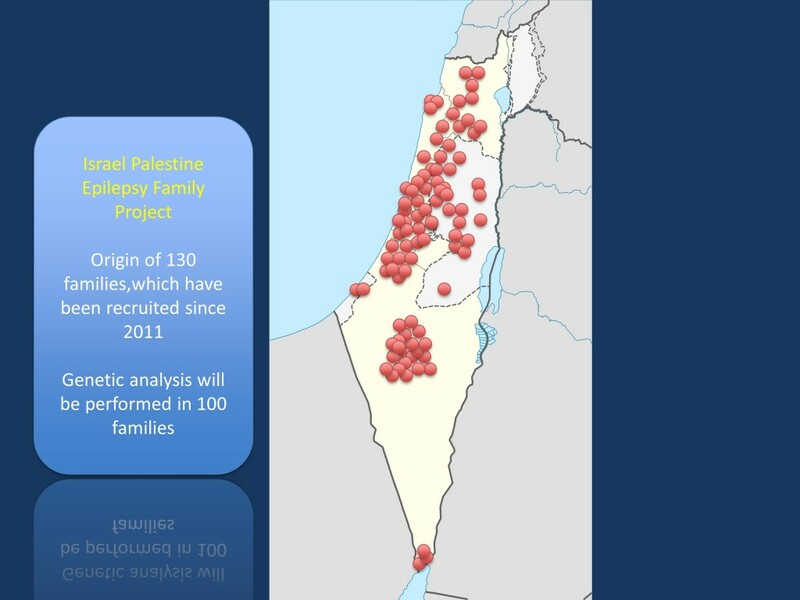 Origin of the 130 families already recruited in the Israel Palestine Epilepsy Family Project. We will perform genetic analysis in 100 families and make the genetic data from these families available for data mining within the epilepsy genetic community. Beethoven. Don’t judge the city of Bonn by its train station and central bus terminal. I went to Bonn in September last year to personally present our Trilateral Grant to a committee of the German Research Foundation (DFG). I took the train, and after figuring out which bus to take to Bad Godesberg, I embarked on an idyllic bus ride through the Southern suburbs of Bonn. Given that Bonn was the former German seat of government, many government agencies are still located there. While my bus was cruising past a giant Beethoven statue, I promised myself that I would want to use this grant for something novel – if this grant happened to be approved at all. I promised that I would write a blog post entitled “A change of mind in the city of Beethoven”. Fast forward to a nighttime consult call at the Hospital of the University of Pennsylvania in November 2014. I was just on my way for an adult neurology consult on Founders 10 at 2AM in the morning. My CHOP iPhone buzzed with an email from our epilepsy genetics group in Kiel. It had a scanned PDF attached that I was barely able to decipher. After applying three times in a row and four years of waiting, the DFG had approved our grant in full. The crisis of family studies. So what is this mysterious change of mind that I promised to write about? And what is the crisis of epilepsy family studies? Let’s start from the beginning. I had a discussion with one of my colleagues in our resident room two days ago about a family that he saw in clinic with two siblings with Childhood Absence Epilepsy and one parent affected by Juvenile Myoclonic Epilepsy. We know that Idiopathic/Genetic Generalized Epilepsy (IGE/GGE) has a strong genetic component and we have three affected individuals. A family like this should be genetic slam dunk – except that it is not. The chance of finding a causative gene in this family is probably 5% or less. Contrast this with the probability of 30% or higher to find a causative gene in a patients with sporadic West Syndrome or Early Onset Epileptic Encephalopathy. In the last few years, the genetics of severe epilepsies has taken off. However, our progress in understanding inherited epilepsies has only progressed slowly, and small families like the family mentioned above are often impossible to solve. Exome and genome sequencing does not help – you’re only drowning in a cacophony of genetic variants. This is where Beethoven comes into play. Families unsolved. On my bus ride to Bad Godesberg, I realized that no matter what we will do, 70-80% of all families will remain unexplained. We’ll try to do our best. We will perform exome sequencing in 100 families with multiple affected individuals and have already discovered several characterized and promising novel genes. We will continue to recruit families with dominant and recessive epilepsies in Israel and Palestine. In contrast to many other Western countries, families in Israel and Palestine are larger and have a higher degree of consanguinity. Therefore, investigation of familial epilepsies in the Middle East provides a unique opportunity for the discovery of novel epilepsy genes. However, the truth of the matter is that probably more than 80% of all families will remain unsolved. Here are our data. I realized that there are basically three important things about genetic studies in small families: data sharing, data sharing, and data sharing. We had already used words like “virtual gene hunting” and “data mining” in our initial proposal, but the real implications of this only really hit me on my way to Bonn: no matter how good we are, we will have more than 80% of families unexplained by the end of the funding period. Moreover, having witnessed the complex and twisted roads to gene discovery, some of these families may be explained with future gene findings in unexpected ways. Therefore, the only way to stay on top of things is to have other people mine your data. While we’re currently getting started with the genetic analysis, we’re also creating a family database through the LCSB in Luxembourg programmed by Roland and have genetic data available through Varbank in Cologne and likely also EGI in the future. Eventually, we will create a separate database that combines phenotypic and genetic data and is publicly available. Even though we will spend most of our time looking for genes, we are well aware that in many cases, the genes will actually find us. We just have to make this data available. The Israel Epilepsy Family Project. I feel honored to be the Principle Investigator of the “Israel Project”, which I always considered one of the flagships of international epilepsy research. This project was initially established by Sam Berkovic who phenotyped more than 200 families during his research trips to Israel and Palestine. The families recruited in his initial project were instrumental in the discovery of various epilepsy genes including PCDH19, TBC1D24, DEPDC5, and KCNT1. Zaid Afawi (see below) was involved in the recruitment of virtually all families that were part of the initial project. We were offered to continue the project in 2011 and were able to enlist the help of various young researchers in the European epilepsy genetics community. We were even able to hold our 2013 Young Investigator’s meeting in Sde Boker, Israel. In the meanwhile, we have recruited more than 130 families and our DFG funding allows us to continue the recruitment for the next few years. People. I would like to introduce some of the people who are working on this project. I am only able to name a few key people on this project and would like to emphasize that this is a project that is maintained by an entire network of clinical and genetic collaborators. Here are the main people on this project: Zaid Afawi at Tel Aviv University is the Principle Investigator (PI) on the Israeli side. Zaid’s name is virtually synonymous with family studies in Israel and Palestine and needs no further introduction. Moien Kanaan at Bethlehem University is the Palestinian PI. He has traditionally worked on hearing loss and we’re excited to have him on board for neurogenetics for this project. Moien runs a fully-fledged molecular genetics laboratory in the West Bank including next gen sequencing. Ilan Blatt at Tel Aviv University manages IRB and administrative infrastructure in Israel and is involved in the organizational structure of this grant. Karl Martin Klein (Frankfurt) is our CPO (“Chief Phenotyping Officer”) and is in charge of making sense of the phenotypic complexity in some of our families. Sam Berkovic (Melbourne) and Amos Korzcyn (Tel Aviv) had initially founded and supported the Israel project and are basically the godfathers of this project – we’re extremely thankful for all the past and ongoing support that they have given us so far. This entry was posted in 2015, Israel Epilepsy Family Project and tagged family studies, Israel, Palestine. Bookmark the permalink.